Amazingly enough, Washington’s 46 wins this season were the most since the 1978-79 season when they won 54 games and lost in the NBA Finals. It was a two-game improvement from last year’s surprising 44-win season. And while some probably expected better than a 46-36 record, the Wizards certainly showed their promise in this year’s playoffs. They completely dismantled an overrated Toronto Raptors team. And if it weren’t for John Wall fracturing his left hand against the Hawks this series outcome may have been a little different. At the very least I think we’d be waiting for a game seven in Atlanta. As for next season, the Wizards look to return most of the roster. The one big potential missing piece could be Paul Pierce. His contract is worth $5.5 million next year and if he wants to return for an 18th season I think Washington should welcome him back with open arms. He seemed to really enjoy his time this year, he hit a TON of huge shots, and I think John Wall and Bradley Beal could still use his leadership as they continue to grow in their careers. The Wizards do however have two virtually useless players taking up $17 million in cap space next season. Nene is set to make $13 million in the final year of his contract and he was absolutely brutal in this playoff series to follow his worst regular season in quite a while. And then you’ve got Kris Humphries taking up $4.4 million on their cap next season which isn’t a big number but if he’s going to ride the pine that money can be better spent elsewhere. I’d try to explore some trade options for Nene. Look for a team that may be interested in adding a veteran big for a low price. If David West leaves Indiana maybe give Larry Bird a call and see if he’s interested in filling the void with Nene. Possibly the New Orleans Pelicans might be interested in adding a true power forward next to Anthony Davis so he can play the center position. Cleveland may lose both Kevin Love and Tristan Thompson to free agency if the price isn’t right. Especially for Thompson. They could be another potential landing spot. But for Washington to improve next season they need a few things. Most important is staying healthy. Both John Wall and especially Bradley Beal have been banged up a few times in their young careers. Those guys need to be able to stay on the floor for at least 75 games a year to make a true improvement. Wall and Beal also need to bring it every night. There were several times throughout the course of the regular season that those guys didn’t always bring it. Most specifically Beal. I expected a big jump in his game this year and it didn’t happen, but in the playoffs we saw the jump that everyone expected. Bradley needs to bring that every game for this team to truly become a top seed in the Eastern Conference. I’m sure he’ll continue working at it, but John Wall needs to develop a consistent jump shot because if he does he’ll be completely unstoppable on the offensive end. He doesn’t need to be Steph Curry but if he can consistently hit a mid-range jumper and be a threat from the three-point line it can go a long way. And the other HUGE piece for this team going forward is Otto Porter. The former No. 3 overall pick has shown next to nothing in his two years in the league. At times even getting benched in his second season. But his playoff run this year was extremely encouraging for the growth of his career. Porter’s playoff sort of reminded me a little bit of Draymond Green’s impact in last year’s playoffs for Golden State. I don’t think Porter will be as good a player as Draymond was this year but he could eventually make the all-around impact we saw from Green and that could go pay dividends in this team’s development as they hope to make the next step. Washington could also use at least another shooter outside of Bradley Beal. I’d love to see them acquire a guy like Ryan Anderson at the power forward spot. Create some more spacing in the middle for Marcin Gortat and have a deadly three-point shooter for Wall to kick it out to. Not sure I exactly see a Nene for Anderson swap in the works, not a ton of incentive on New Orleans’ end to do that unless Washington adds a little extra in the deal. But I don’t think the Wizards need to add much. They don’t have financial ability to do so anyway this off-season. But a blockbuster trade isn’t a necessity for this team. Just the continued development in Wall, Beal and Porter next season. Barring injury, I think we see a 50-win season next year for Washington. Possibly even a conference finals appearance. Maybe that’s enough to entice Kevin Durant to come back home? If so, an NBA Finals trip the following season is a very strong possibility. 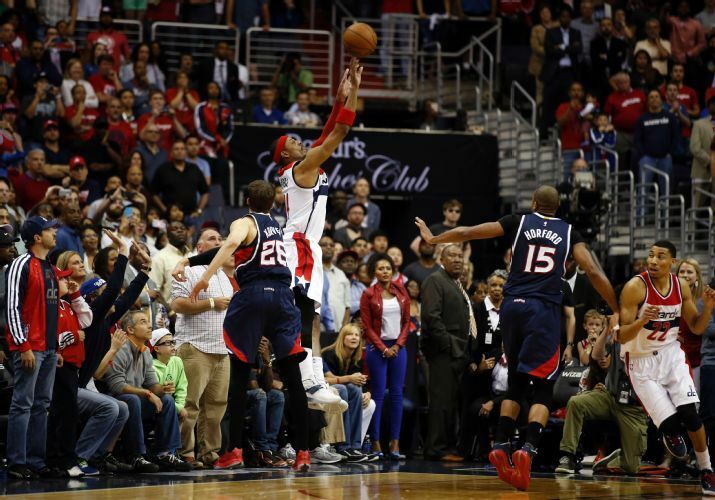 I think Paul Pierce could leave Washington, if so, it would not be easy for the Wizards to replace him. Completely agree. Not so much from a production standpoint over the course of the regular season, but his experience to the team I felt was vital. Especially in the playoffs. We appreciate your comment and follow.